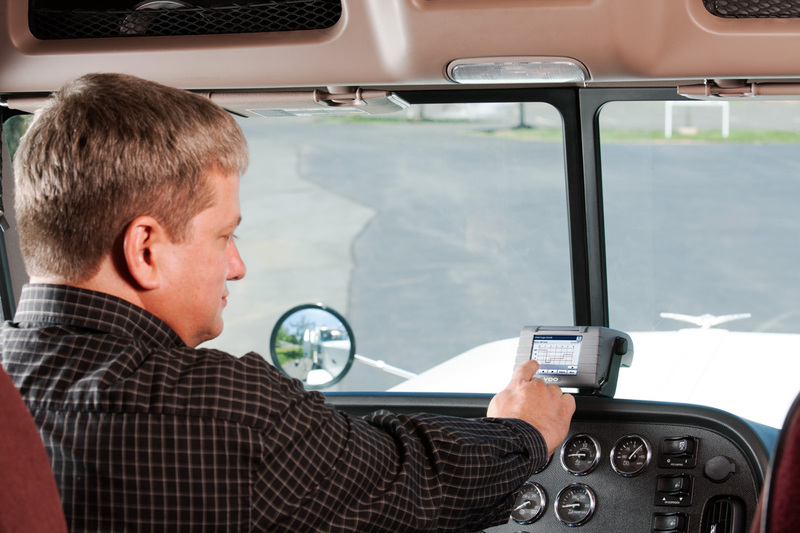 The debate on mandatory electronic logging devices has been going on for a long time. Drivers are either for them or against them, while larger companies are definitely for them. The main contention of the large companies is that E-logs will improve safety. However, a major factor is that it will save the large carriers approximately $1 billion a year in not having to keep so many supporting documents required for using paper logs, so the ATA says. As in anything, in trucking one has to follow the money trail. It appears according to a video release put out by the ATA, that companies with E-log systems now will be allowed to grandfather in and not replace what they already use for at least two years after other companies have to purchase the required systems. Companies not now using E-log systems of course will have to comply most likely within two years after the final regulation is in place. The cost for the unit alone is $600-800 each plus a monthly service fee. While this may not seem like it would be too costly for some, for a 100-truck company, that would be $80,000 they would have to come up with just to buy the units. Add the monthly service fee, for argument’s sake say $5.00 a month per unit, that would be an additional $500 a month or $6,000 a year. That is a lot of money for a small company to come up with in today’s economy. Furthermore, according to a recent poll, 51% of the experienced drivers polled said that if this regulation goes into effect, they would leave trucking. Is this another branch in the money trail? Experienced drivers are at the top of the pay scale, with the so-called driver shortage already in play, and older more experienced drivers retiring, could this be a ploy to run those experienced drivers out of the seat to be replaced with inexperienced and foreign drivers paid less increasing a company’s bottom line? Billy Woolsey, President of Midwest Compliance Inc ., states in a letter to the editor to Transport Topics about EOBRs, “But all that information carries a price because drivers are likely to favor carriers without e-logging devices.” Therefore, driver retention also enters the mix of winding money trails. One of the major causes of disagreement is the report of harassment used against those drivers running E-logs. There were so many of these reports that OOIDA filed suit against the FMCSA and won. Congress also in MAP-21 told the FMCSA, as did the Federal Courts, to come up with ways to ensure that the E-logs could not be used to harass drivers. Recently, they came up with eight points against harassment use. Requiring drivers’ access to records: The rule would require that drivers have the ability to obtain copies of their ELD records “on or through” the devices. It also would require that carriers give drivers copies of their records (for the six months carriers are required to keep the records) when a driver asks for them. This will help a driver in their tax preparation but how will it stop harassment? Explicitly prohibiting harassment: In the rule the agency prohibits carriers from harassing drivers with the devices. Harassment, per the rule, means, “An action… involving the use of information available through an ELD…that the carrier knew or should have known would result in” a driver violating FMCSA regulations regarding fatigue or illness. There has been a regulation on the books for decades where the driver makes the decision as to whether it is safe to go or not due to weather, illness or fatigue, and we know how well that works! Instituting complaint procedures: The rule implements a process by which drivers should file harassment complaints, including what the complaint would need to include the action the carrier took and how ELD technology was used to contribute to the alleged harassment action. It takes acrobatic maneuvers to file a complaint now; most drivers get frustrated and give up before completion. The government makes it so easy to get anything done in their systems; can anyone say DATA Q? Stiffening penalties to deter harassment: The new rule dictates that harassment will now be considered a violation of hours-of-service rules, and “the penalty for harassment would supplement the underlying HOS violations,” according to the rule. This one makes little sense. There should be no HOS violations if everyone is doing the E-logs legally. Will the driver take a hit on an HOS violation too? Requiring mute functionality: As drivers have complained of carriers contacting them during rest periods through an ELD or related fleet management system, the rule stipulates that when a driver places an ELD into sleeper berth status, the device must automatically mute and turn off any sound output or at least allow the driver to manually mute the device when in sleeper mode. They forget cell phones, having another company driver stop to bother the driver, or even as has been reported, having the local police come out and do a ‘well being check’ on the driver. Instituting edit rights: The rule allows drivers and carriers to request edits to the electronic records of duty status. “Edit,” according to the rule, means a change that would not overwrite the original record, however. All edits or annotations on the records would be required to show who made them and the reason for the change. Edits made by carriers or drivers would need to be sent to the other party for approval. Since the first E-log went into a truck, dispatch has figured out a way around them to ‘make’ more hours available. I give them 24 hours; they will figure it out this one too. Limiting portions of vehicle location tracking: The rule does not require real-time vehicle tracking or location recording and does not require transmission of real-time location to carriers or law enforcement. Location data will be sent when a driver changes duty status, a driver inputs personal use or yard moves, the truck’s engine powers on or off and at 60-minute intervals when the vehicle’s in motion. Unless the driver is going to the bar, what good is this? Any satellite system can ‘ping’ upon command and dispatch can always make up a reason to do so. Allowing privacy in enforcement proceedings: MAP-21 directs FMCSA to institute measures to protect drivers’ personal data when information from an ELD is used in enforcement proceedings. To do this, the agency says it will redact information before a document is made publicly available. Any of you believe this will really happen? No thinking driver will. One of the main issues concerning harassment reported by drivers using E-logs is being forced to drive if they have available hours no matter what. Yes, there is the now mandatory 30-minute break, but other than that, reports flow in that if a driver stops else wise, they are chastised, or threatened with job loss even if they are nodding off and need a nap. Yet, this form of harassment is not addressed in the above. Forcing a driver to ‘maximize’ their hours no matter what is all about productivity equaling money and for the carrier to meet contractual agreements, not at all about safety, or a driver’s well being. There have been ample HOS regulations for decades; the problem comes in with enforcement. The FMCSA can make all of the regulations they choose, but without enforcement, they are worthless. This EOBR or ELD regulation is not going to affect safety in a positive way; seeing how many carriers using E-Logs end up in the ditch or worse every day proves this. This is all about money and leveling the playing field in the dog-eat-dog world of trucking for the large carriers. These large carriers have to squeeze out small carriers that can run faster or by forcing those same companies to go broke trying to buy the new technology, the large carriers are pushing for a competitive edge through regulation. The proposed rule has yet to be published in the Public Register at the time of this article, but it is thought to do so by the end of March 2014. This will open up the 60-day comment session. Anyone can make comments and you can be assured that the ATA and the special interest safety groups will make their presence well known. E-logs should be a business choice, not a mandatory regulation forcing everyone into the same business model for any reason because it sure is not about safety at all. If you would like to make a comment on this issue look for docket number FMCSA-2010-0167 when the proposed rule goes into the comment period. PreviousWhat a Way to Spend a Weekend!